Ramon's background is in carbonate sedimentology with a focus on the integration of regional, outcrop, and laboratory data. His current research interest deals with the sedimentology and geobiology of unusual hyperalkaline, lacustrine carbonate settings. 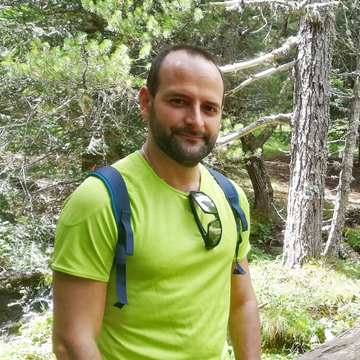 Ramon's major ambition lies in gaining insights on the ultimate paleoenvironmental significance of microbial carbonate factories by combining classical methodologies (outcrop-petrographic) data and geochemical modelling) and laboratory approaches (geomicrobiology, high-resolution biomarker analyses). His major goal is understand the biogeochemical controls governing the multiscale petrographic heterogeneity of microbially-influenced carbonate deposits. Enrolled, since 2014, in a BP-University of Hull project aiming at develop a new suite of process-based insights into the origin, sedimentology and geochemistry of lacustrine carbonates in early rift tectonic settings. This project arises from an international collaboration involving the Vrije Universiteit Amsterdam and the University of Aberdeen. This project entails an innovative experimental programme focused to understand the link between solution biogeochemistry and the morphogenesis of naturally-occurring calcite precipitates. Mercedes-Martín, R., Brasier, A. T., Rogerson, M. R., Reijmer, J.J.G., Vonhof, H. B., and Pedley, H. M. (2017) 'A depositional model for spherulitic carbonates associated with alkaline, volcanic lakes'. Marine and Petroleum Geology, 86, 168-191. Rogerson, M. R; Mercedes-Martín, R., Brasier, A. T., McGill, R.A.R., Prior, T., J., Vonhof, H. B., Fellows, S. M., Reijmer, J.J.G., McClymont, E., Matthews, A., and Pedley, H. M. (2017). 'Are spherulitic lacustrine carbonates an expression of large-scale mineral carbonation? : a case study from the East Kirkton Limestone, Scotland'. Gondwana Research, 48, 101-109. Mercedes-Martín, R., Rogerson, M. R., Brasier, A. T., Vonhof, H. B., Prior, T. J., Fellows, S. M., Reijmer, J.J.G., Billing, I. and Pedley, H. M. (2016). 'Growing spherulitic calcite grains in saline, hyperalkaline lakes: experimental evaluation of the effects of Mg-clays and organic acids'. Sedimentary Geology, 335, 93-102. Mercedes‐Martín, R., Salas, R., and Arenas, C. (2014). 'Microbial‐dominated carbonate platforms during the Ladinian rifting: sequence stratigraphy and evolution of accommodation in a fault‐controlled setting (Catalan Coastal Ranges, NE Spain)'. Basin Research, 26(2), 269-296. Mercedes-Martín, R., Salas, R., and Arenas, C. (2013). 'Facies heterogeneity and depositional models of a Ladinian (Middle Triassic) microbial-dominated carbonate ramp system (Catalan Coastal Ranges, NE Spain)'. Marine and Petroleum Geology, 46, 107-128.